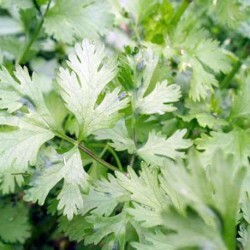 Plain Leaved Parsley is a must have herb in any kitchen. 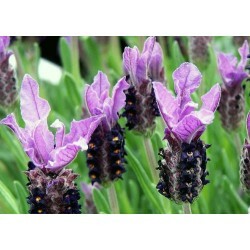 Very popular and easy to grow year after year. Can be grown in the windowsill all year around. Parsley is a widely used and versatile herb, plus it’s easy to grow in pots or in an outdoor herb garden, and growing these herb seeds is easy and 1000 seeds will grow into plenty of tasty plants. Parsley also can be treated as a perennial herb, just cut them back well for the winter and the strong roots will survive the British climate. A sprig of parsley is often placed on plates as a garnish in restaurants, but many customers don’t realize the herb does more than just make the plate of food more attractive. The green sprig is actually placed on the plate to be used to freshen breath after the meal. 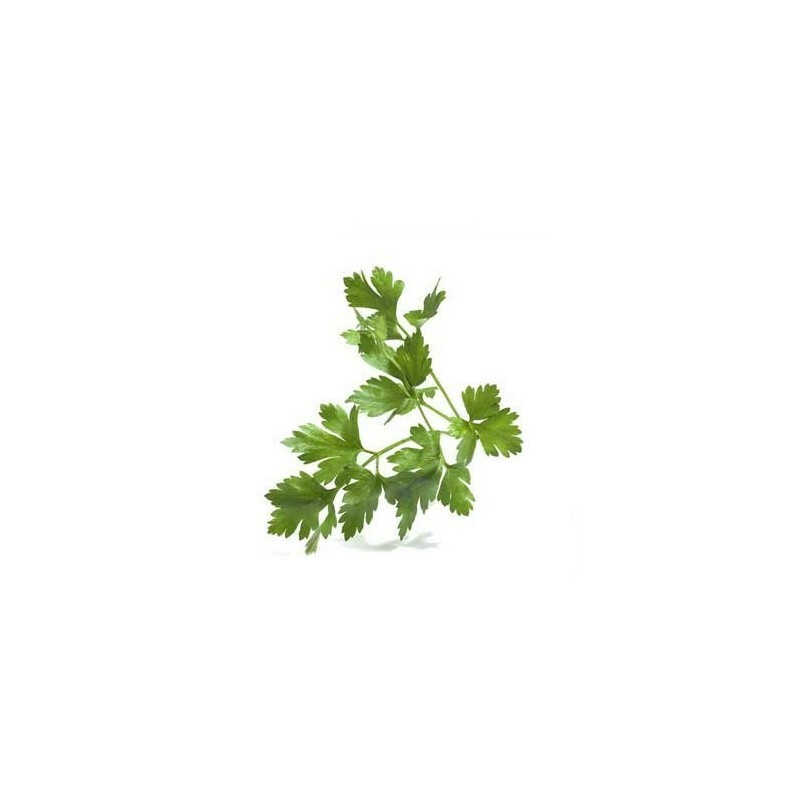 Chewing a fresh sprig of parsley after a meal will eliminate bad breath. The flavorful herb is also used in many recipes to add a extra layer of flavor. Parsley can be grown in any climate, but it will behave differently according to the temperature. In colder climates the herb will be an annual and will have to be re-planted each year and in warmer climates the herb will be a biennial and return the following year after planting. When grown indoor in pots, planting seeds every few weeks will ensure a steady supply of fresh parsley year around. 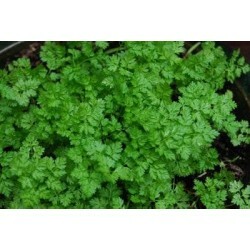 Parsley is one of those rare garden plants that does not prefer direct sunlight. A little dappled sunlight peeking through taller garden plants is perfect for this herb to thrive in. When growing indoors, place the pot in an east-facing window so the plants will only receive the morning sunlight. Plant seeds outdoors in the early spring after all danger of frost has past. Parsley can be planted and grown year around indoors in a warm, partly sunny location. 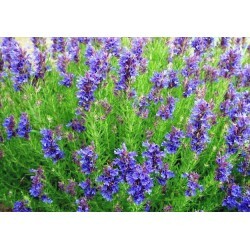 While this herb prefers less sun, it is very demanding in its soil requirements. The planting soil, whether in-ground or in pots, will need to have a pH of between 6 -7. Do a soil test to determine the pH and add required amendments. Work in soil amendments and compost to the depth of 6 - 8 inches for outdoor planting or mix soil, amendments and compost and place in a 6 inch- deep pot for indoor planting. The planting soil also must be loose and drain well so the tiny roots will not have to struggle to grow in the soil. To get the right soil for best plant growth, mix soil with organic compost at a 50-50 ratio. Parsley seeds have a tough outer shell that makes it difficult for seeds to germinate unless they are soaked first. To prepare seeds for planting, get a cup of lukewarm water and a few drops of washing up liquid. Stir to mix the soap and water, then place parsley seeds in the warm, soapy water and let them soak for at least one hour. After the soapy soak, drain soapy water off seeds through cheese cloth or a fine mesh sieve. Rinse with warm water to remove all traces of soap. Now the seeds will need a final soak to prepare them for planting. Place rinsed seeds in a bowl of warm water and let them sit for 24 hours. At the end of 24 hours, drain them and place them in a single layer on paper towel to dry for an hour or so. The parsley seeds (you may see sprouts) will be ready to plant once they are dry. Make shallow trenches in prepared soil 10 inches apart. Place seeds in the trenches at 3 inch intervals. Gently cover with 1/4 of dry soil, then water in well. To plant in pots, place two seeds (soaked and dry) in the center of a pot that is at least 6 inches deep and wide. Sprinkle seeds with dry soil and water. Keep soil moist at all times while seeds are germinating, then water plants anytime the top layer of soil becomes dry. Add a few drops of water soluble fertilizer to water weekly to feed plants. Harvest parsley by snipping off the sprigs any time the plant has reached four inches in height. Parsley can be started from seeds indoors 6-8 weeks prior to the past frost in your area. Follow the steps outlined above for soil amending, light and temperature needs, plus seed soaking. Plant the seeds in a seed tray or other similar container. When plants have developed their second set of leaves and are 4 inches tall they can be transplanted. Use a spoon to gently lift plant and roots out of soil and place into the prepared soil of the parsley’s permanent growing home.